Bad Company kicked off the Swan Song Tour with a gig in 3Arena, Dublin on 14th October. The line-up included founding members vocalist Paul Rodgers, guitarist Mick Ralphs and drummer Simon Kirke. The other members of the band are Howard Leese on guitar and Todd Ronning on bass.From Dublin the tour moves on to the UK for 8 dates. 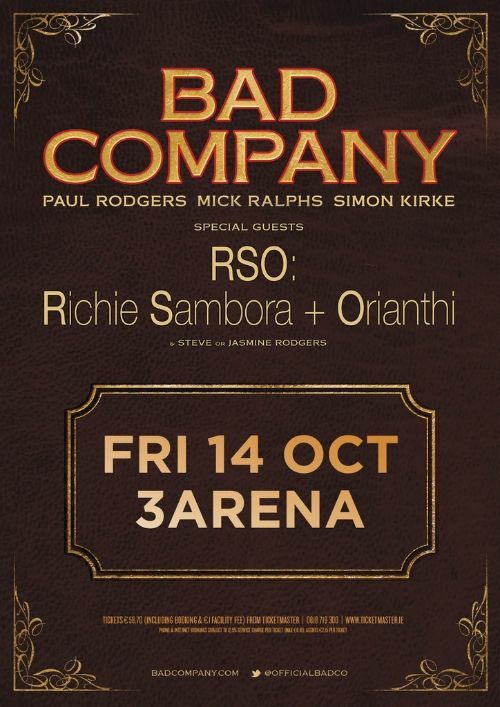 Supporting Bad Company are RSO (Richie Sambora and Orianthi). I took 5 videos of Bad Company during the Dublin gig – the classic tracks “Feel Like Makin Love”, “Run With The Pack”, “Shooting Star”, and “Bad Company” and a new track called “Troubleshooter”. Richie and Orianthi focused on their previous solo material and Bon Jovi tracks rather than tracks from their forthcoming album. There are 4 videos on the NI Rocks YouTube channel.